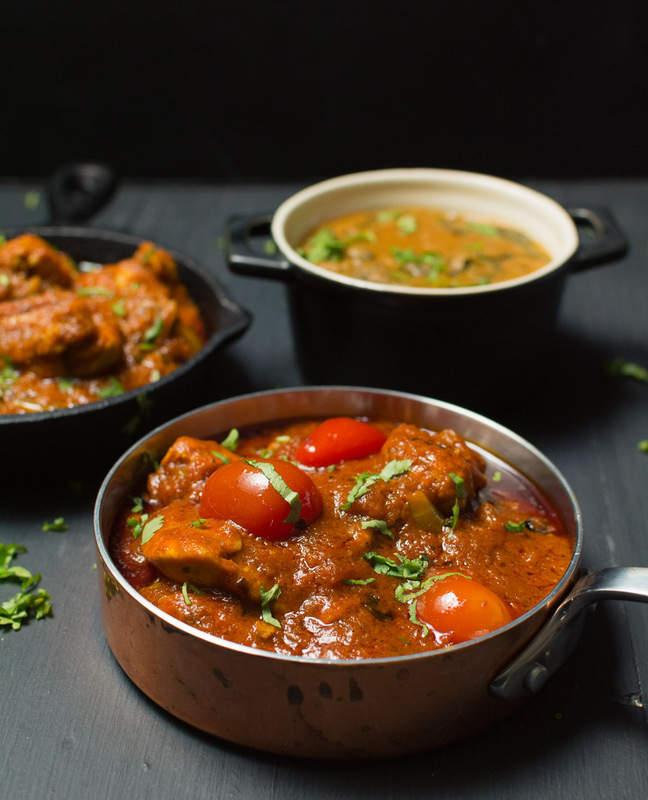 Indian restaurant bhuna curry is a recipe that shows up all on menus all over the place. It’s typically a thick, well spiced, medium hot dish. It’s really tasty. This bhuna is just that. There’s no real guideline other than that. That’s why it’s so different from restaurant to restaurant. Kind of like balti in the UK. I think bhuna varies so much in restaurants because technically it’s not a dish. It’s a way of cooking. By definition spices are gently fried and then meat is added. The whole thing is left to stew in it’s own juices. At the end, you wind up really big flavours and not a lot of sauce. Super concentrated curry. I’ve looked at quite a few definitions of bhuna and it seems to come down to a curry with onions, garlic, tomatoes, chilies and spices. 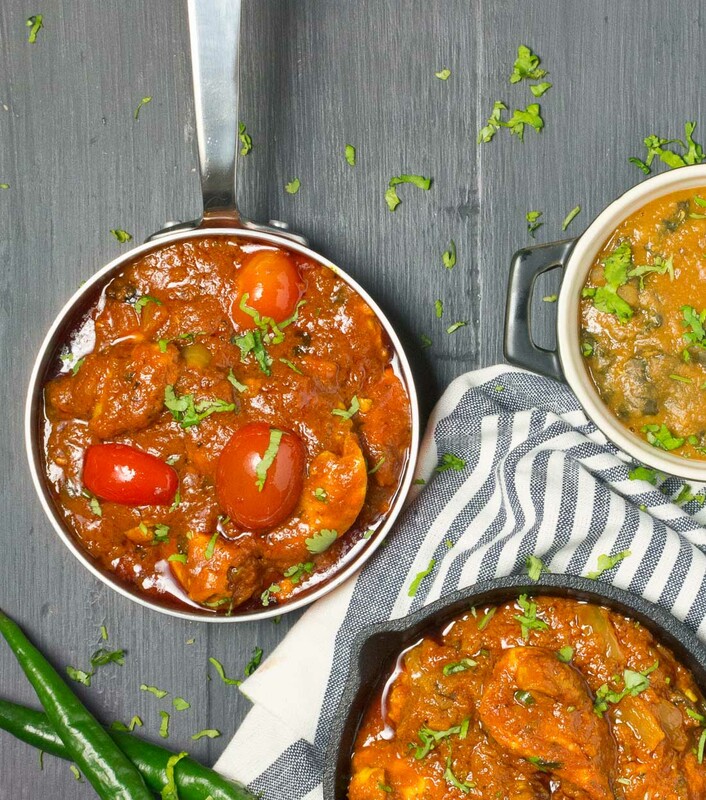 That’s what this Indian restaurant bhuna curry recipe is all about. I hope the curry police don’t come and take me away for misleading people with this post. Or worse yet, take away my spices and condemn me to cooking curry with pre-fab curry powder for the rest of my life. This is a master Indian restaurant bhuna curry recipe. You can make it with pre-cooked chicken, lamb, beef or use paneer, pre-cooked potatoes or eggplant for vegetarian options. Enough oil to fry the spices. That is a fundamental rule to Indian restaurant style curries. You can’t get around it. Too little oil and your spices will stick. They will burn. Not good. It may seem like a lot of oil but it’s necessary. I’ve tried rolling back on it. It doesn’t work. Pretty much guaranteed to fail. And frying spices is what makes bhuna curry what it is. Any curry really. It’s worth the extra calories. Do your prep. That’s important. Make your curry base and have some heated and ready to go. Pre-cook your meat. Measure out your ingredients. Have everything ready. Put on an apron – a bit of splatter is part of the fun. If you have not yet read the guide to Indian restaurant technique yet, do it now. It has pictures to help you understand the recipe. There’s a video there so you can see for yourself. And a guide to Indian ingredients in that post. 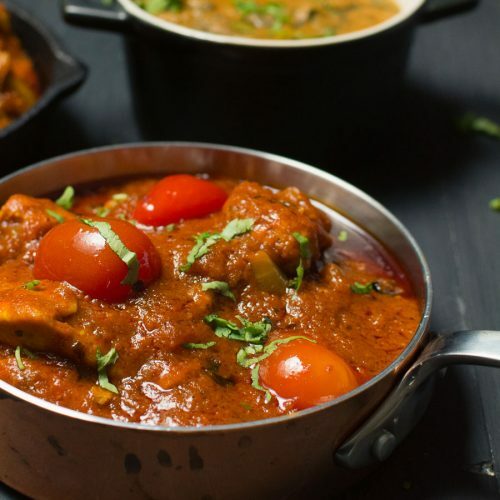 Indian restaurant bhuna curry is a thick, medium hot curry heavy on the tomato and long on flavour. When the oil starts to shimmer add the onions and stir constantly until the edges of the onions start to brown. This takes about a minute. Add the green chilies and cilantro stems. Cook about 15-20 seconds. Add the rest of the curry base and let cook until the bubbles form. Add the tamarind sauce. Turn the heat down to low and add the pre-cooked lamb, beef, chicken, tofu or vegetables. Let the curry simmer for about 5 minutes. If it gets too thick add a bit more curry base. Don't add water. Add the cherry tomatoes for the final 2-3 minutes of cooking. This looks delicious – nice consistency with a deep, rich color – tells me this has some real flavor! I love how quickly it comes together, too, due to all the prep you do in advance for different ingredients! *drooooling* This looks fantastic. I went out to buy kasoor methi and am excited to have your recipe guide me through an awesome curry recipe! haha I have ‘chili’ powder from the indian grocers but I am not 100% sure if its kashmiri chili. They all say, chili. o_O Hope I have the right one! Watch out for the chili. Kashmiri is pretty mild and it can go all the way up to incendiary. Around here kashmiri chili is marked as kashmiri. There’s also a chili powder from MDH called Deggi Mirch (comes in a little box) that is about the same heat. Yay more curry! I can’t get enough of your awesome curry recipes, Romain! They always make me hungry. Love the tomato base in this one. I’ll have to try it using your Indian Restaurant Spice Mix! Yum! I had no idea that bhuna was a technique rather than a dish! Your photos of this bhuna curry are fantastic. It makes me immediately think cold evening, warm dinner, hot spices, blankie and a movie night. Do you typically use chicken or lamb? With all my curries lamb and chicken are interchangeable. You need to allow for longer to pre-cook lamb of course, but otherwise it’s exactly the same. I also do vegetarian versions by mixing one recipe worth of restaurant curry without the meat into 3 cups of cooked masoor dal. Play with it. It’s fun! 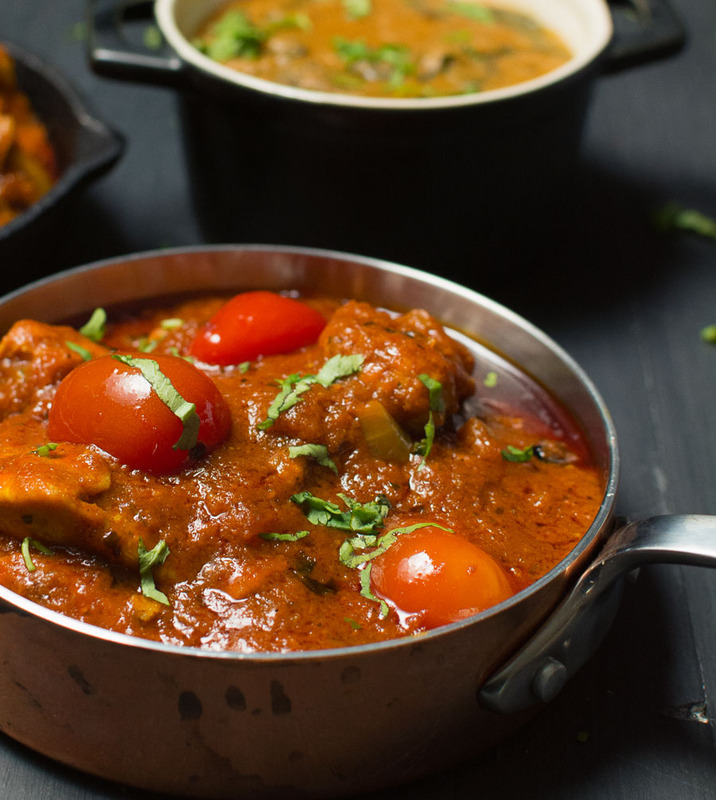 Its so great to learn all these restaurant tricks for cooking Indian food! I love concept of prepping everything beforehand. This would be perfect for having company over for dinner when you don’t want to spend your whole time in the kitchen. Riva, depending on how many dishes you cook it can still be a fair bit of work so keep that in mind. It’s about 10 minutes of dedicated cooking time per curry plus rice, plus a lentil dish, plus whatever else you want to serve. Helps to have someone to clean pans for you between curries though! Thank you for another wonderfully detailed recipe, I always learn so much from your posts! Curry is one of my favorites and I’m never satisfied with what I get when I order it out, I can now try to make my own at home with your help, thank you! Erica – you are so very, very welcome! I cannot believe I somehow missed this comment Jay. Thank you so much! I am absolutely delighted my recipes are working out for you. Where do the large tomatoes come into the recipe, like the picture shows? Corrected. Thanks for the catch, Si. Another great dish , I’m becoming very confident with your cooking technics in preparing my curries mind you I was a bit heavy with the chillies this time haha . I’m hoping sometime you’ll come up with a vegetable curry recipe. More chilies can definitely be a good thing! So glad you’re enjoying the recipes, Mike. Glad you liked it. Fenugreek leaves add a real something so do try that. I still remember the first time I added them. It was an aha moment for me. If you use tamarind sauce (unsweetened) then you might want to add a little sugar. Taste it first and decide. The paste (if it’s the same as mine) a bit more tart so maybe add a little less than the recipe calls for. Again, tasty and decide. Good luck! Hi, thanks for your brilliant recipes. My family love them,they all fancy a buhna this weekend. I made the recipe for two the other week and it was awesome. There will be six of us this weekend and I wondered what adjustments to make to the spice mix etc.thaks again Phil. Phil – it’s the same challenge as the aloo chaat chicken curry (and every other restaurant style curry on glebe kitchen. They don’t scale well. You could maybe scale up 50 percent and do it twice or do it three times. Just keep each batch warm in a pot as you make it. It does hold well over very low heat for long enough to make the 3 batches. If it gets too thick mix in a bit of curry base to get it back to the texture/consistency you like. So glad you found it! I’m not in the UK but I see there are a number of online retailers in the UK that carry it. Also, if you can find a shop with MDH products (look for rows of little boxes of Indian masalas) they have one called Deggi Mirch. That is an excellent substitute for Kashmiri chili powder. Alternately, you can ask your grocer for a mild Indian chili powder. Kashmiri is bright red but if you aren’t concerned about the colour it imparts most any mild Indian chili powder will do.